Last week, Prince Harry and Meghan Markle, visited Dubbo, Australia, as part of their royal tour. They were greeted at the airport by children, including 5-year-old Luke Vincent, who has Down syndrome. Vincent’s school principal, Ann Van Dartel, made it clear to the children they were not allowed to touch the royal couple, as is protocol. 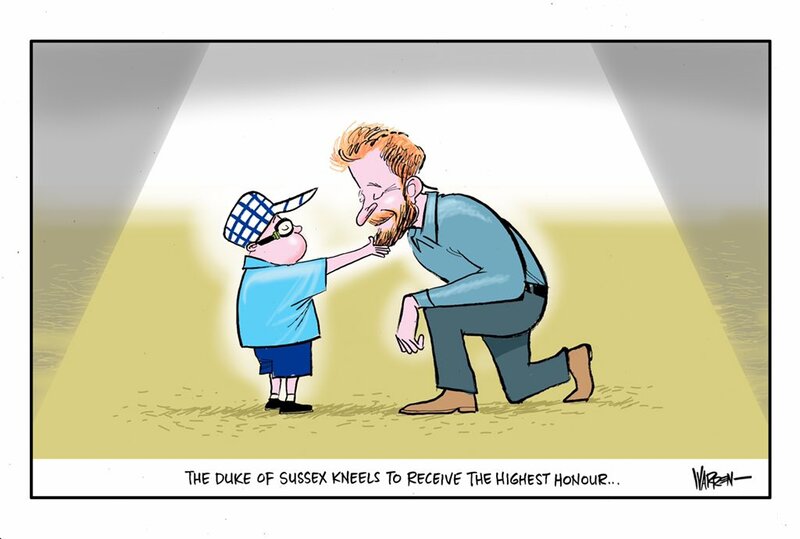 But as Prince Harry kneeled down to greet Vincent, he immediately threw his arms around the Duke of Sussex and then tugged on his beard. The only Royal who gets "down and dirty" with the common people ! Saw it on YT few days ago. Sweet heart-melting picture. But how exactly did Harry ''break'' protocol? Surely you did not expect him to look shocked and affronted and push the poor little kid away. Harry simply responded in kind, instinctively. nicko wrote: The only Royal who gets "down and dirty" with the common people ! Just like his mum did.